Cuisinart 12 Piece Knife Set Just $19.99! Down From $50! You are here: Home / Great Deals / Christmas Deals / Cuisinart 12 Piece Knife Set Just $19.99! Down From $50! Right now JCPenney has this great deal: Cuisinart 12 piece knife set just $19.99! These are highly rated and down right now from $50! I have a set very similar to these and I love the color coding, it makes it much easier in the kitchen when you know which color knife to use for cutting meat or veggies or even breads. They also have colored sheaths to keep them sharp and protected , as well! They are on for $29.99, just use code: JOYFUL at checkout to get yours for just $19.99! You can also have them shipped to your store for pick up on purchases of $25 or more or get FREE shipping on purchases over $49. 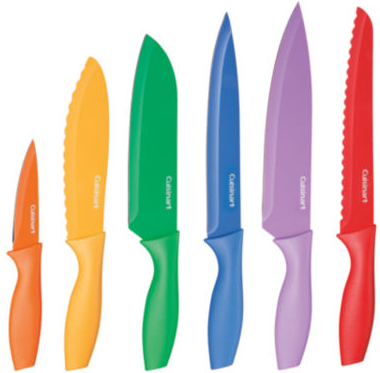 Add a bright burst of color to your kitchen with this multi-hued knife set from Cusinart. High-quality stainless steel blades make easy work of any cutting job and the color coding makes it easier to remember which knife goes with meat and which with vegetables, reducing the risk of cross-contamination. Stainless steel. Dishwasher safe. Manufacturer’s lifetime warranty. Imported.